It is almost 11:00am and I can see the sun shining warm and bright in the sky out the window of the train station. I make a couple quick clothing adjustments and take a deep breath as I feel the adrenaline pumping through my veins. I emerge from the station with six others to cross the street and get into position, melding our bodies with the metal sculpture above and around us. We wait, though this doesn’t feel like a typical performance debut for me; it is so different from most other performances in which I have participated. There are cars still circling around us in the roundabout and the audience isn’t particularly larger than it was for rehearsals — though I see many familiar faces waiting for us to begin out of the corner of my eye that were not our usual audience members. The first clang of the music announces the start of the piece and I feel the vibrations in the sculpture from my colleague purposely slamming the sculpture with the palms of her hands. It’s almost my turn to circle the leg of the sculpture. I take a deep breath and step out of my hiding place and into the sun. This might sound an obscure performance space, but it was actually the best rehearsal space I have ever been in. I was selected along with six other dancers from around the United States to collaborate with Stephan Koplowitz and John King, the first being the site-specific choreographer for the project, the latter was the composer. I first made a connection with Stephan when he worked with the Gustavus Dance Company in the spring of 2012 for the Sesquicentennial. Stephan had done four site-specific pieces at Gustavus, and I was privileged enough to be in three of the four. He had invited a handful of students to join him in Spoleto, Italy for this workshop in June/July but I was the only one interested and able to pursue making it a reality. Back in April, it had been a struggle to find the funds to cover the expenses of food, travel, housing, and festival fees, but through the help of the Gustavus T/D Department, the Gustavus GWS Department, and La MaMa (the festival’s sponsors) I was able to make this far-fetched dream a reality. I would not have been able to participate in the festival without the generosity of the people in those groups and for that I could not be more grateful. 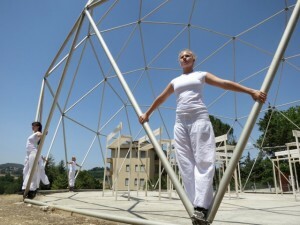 The festival, La MaMa Spoleto Open, was in Spoleto, a little town ninety minutes northeast of Rome. There are two festivals in Spoleto during the summer, and the one that I worked in was the “fringe” festival of the two. We opened the festival on June 30 for two days of four site-specific performances each day (I, again, was in three of the four), but before we were able to do that, we engaged in hours of rehearsal in the sun, rolling in dirt, and being covered in sunscreen and sweat all the while. But as I sit in my air-conditioned house, having recently showered and wearing clean clothes, I am nostalgic for wearing alternating dirty dance shorts, remembering the day when being in the sun made me nauseous because of the intense amount of time we spent under the cloudless sky. I miss being so exhausted I don’t think I will ever catch up on sleep and spending fifteen hours a day straight with the same eight people – and loving spending time with them (almost) all of those fifteen hours. The first sculpture, as previously mentioned, was in the center of a roundabout, across the street from the train station. This meant that throughout every rehearsal there were cars, buses, and motorcycles circling us in addition to a constant audience of bystanders waiting for the train. People would shout, “bella, bella!” out of their car windows; bystanders would approach Stephan to tell him how much they appreciated work that was creative, innovative, and experimental; at the end of every run, people would applaud. The open appreciation for what we were doing was incredible. Stephan said that that open appreciation during rehearsal would be one of the most outstanding memories for him about working in this festival. The physical sculpture is challenging to describe – maybe the best way to imagine it is as a dog or horse with many creative liberties being taken. We called the sculpture Calder, after the name of its artist, Alexander Calder. It towered over us with only its five long legs touching the ground. We used the sculpture to inspire movement creation and used our bodies to mimic and compliment the sculpture and the space. We did a series of “tableaus” in which our bodies would squeeze in the crevices of a certain area of the sculpture and imitate the lines that the sculpture made. The seven of us created the details of the movement from assignments that Stephan gave us; he would then organize and direct the movement and tell which dancer to teach their phrase work to whom. 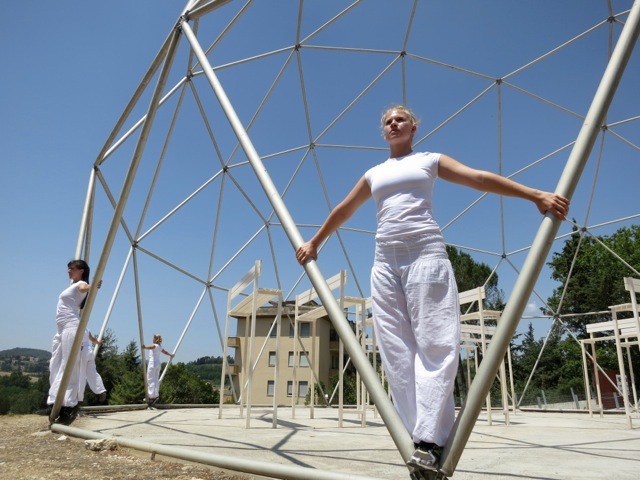 The second site in which we performed was at the Sfera, which was a huge dome-shaped white sphere with metal framework like the lines of a soccer ball. It was next to a park and like Calder, this framework is always there. The sculpture was inside the sfera; four rows of four tall benches with long legs facing inward. This piece was especially challenging because of the intense counting that was required. This piece included an abundance of repetition and running, which was logical with the space we were dancing in. Stephan gave us assignments for this piece as well, though he was just as involved with making the movement as we were for this site. This site had zero shade, which was very trying near the end of the rehearsal process when we were running the dance over and over again. It was most rewarding when we learned after our first performance that the sculptor of the benches had driven five hours from Verona to see us perform with his work. The third and fourth sites were by the clock tower and the duomo. Stephan decided that two of the more experienced dancers would direct us (under his supervision), and the remaining five were split up into groups of two and three. I was in the trio dancing in front of the duomo. There were slanted downward steps leading toward the duomo; the sculpture was along the wall lining the steps; it was metal, asymmetrical, and three-legged. This piece was the one that elicited the greatest natural emotional response while I was performing the piece. It was like we were struggling to go up the wall, creating moments of stillness, of extreme slowness, and of sharpness. At the end if piece, the three of us fell/ran on a diagonal trajectory to come together and weight-share three separate times. The last time we melded our bodies into the steps and rolled as quickly as possible back towards the wall/sculpture where we began the piece. This piece, while inspired by the sculpture, felt much more like it was about the struggle of going up the wall and relating to the duomo. The first night we performed this was amazing. There was a cafe facing where we were dancing and by the end of the performance there had to be at least one hundred people watching us attentively. The second night we performed was the night of the Spain-Italy football game so the audience was much smaller, but before we performed, it was so perfect to see children running up and down the duomo steps as dusk, decked out in Italy colors. It was a celebration of the last two weeks we had spent together in Spoleto. Stephan and I had worked together previously, and one other dancer had taken a course from him at CalArts, but besides that none of us knew each other beforehand; I left with some pretty incredible friends and good connections for my future career in dance. It was inspiring to learn what my colleagues were doing; it ranged from teaching and performing in New York, graduate school in Dance Therapy, using dance to influence massage, and being a student like myself. I also learned more about Stephan; working with him in Spoleto, he did not have an assistant (as he had at Gustavus) so we worked closely together. I also understand his process as a choreographer much more than I had in April. Besides the actual dancing part, the food was definitely a highlight. We went to five restaurants on a rotating basis, but generally they included a meat and cheese platter, pasta and/or meat, bread and olive oil, dessert, and wine (though wine was only at dinner). I ate gelato at least every other day. One night our group went to a vineyard for dinner, which was absolutely amazing. One particularly fond memory I have from that night was after the food and the wine, John King sat at the piano and improvised while another woman at the vineyard improvised and sang. All of us were dancing and laughing and truly enjoying one another’s company. We also went to a couple formal parties as a group, which included battling [dance at a group of] Italians and getting to know the Italians we worked with both personally and professionally. We stayed in a hotel for the first nine days, and the last three we stayed in a villa in the countryside, owned by La MaMa. I am so glad I was able to experience both because the villa really felt like a home, but the hotel was great because it was in the city and we got to experience nighttime in Spoleto a little bit there. After we completed our two days of performances, we all dispersed; most of my colleagues and I were traveling, though we went different places. I traveled to Pisa, Cinque Terre, Venice, Florence, Sorrento, Naples, and Rome, yet after my spectacular experience in Spoleto, not even beautiful Italian art, the ocean, and being able to sleep eight hours a night were able to top my experience in Spoleto. I am truly fortunate that this was able to be a part of my summer and my first experience dancing outside of my collegiate community. I said this when I left, and I still stand by it: Spoleto, I will be back!